Every time when changing something related to batteries, many other parameters potentially change at the same time: Chemistry, response to load, max/min voltages and discharge curves, etc. 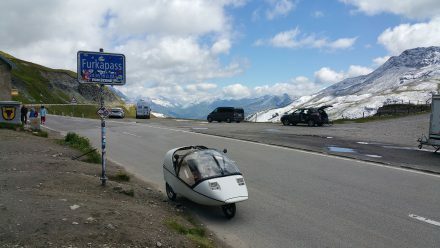 In a way, it feels like being a novice TWIKE pilot again – you really don’t know how your battery will react and – in consequence – how far your will be able to drive. Without a reliable total charge capacity figure, any subsequent computations are meaningless. I’m currently driving with the 29E-config I just left in-place since my 35E pack has at least 14% more capacity. It would, nevertheless, be interesting to know just how much more energy is available to me with the new pack and as a result get reliable range predictions. 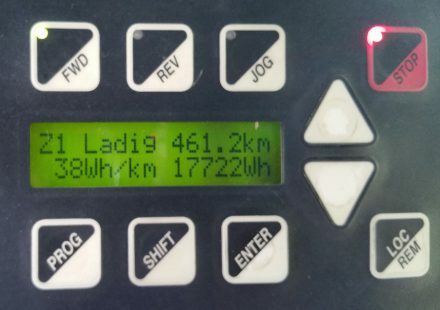 Applying some (many) assumptions and real-world single-cell discharge data gave me an expected capacity of 17.4kWh and an estimated range of about 430km when hypermiling and 320km of full-speed motorway-only range. I was really excited to find out for real. Now: how do I do that? I should, ideally, end up at the same point I started, since I want to exclude any gains from elevation and not be forced to charge somewhere far away from home and drive back hours on end. 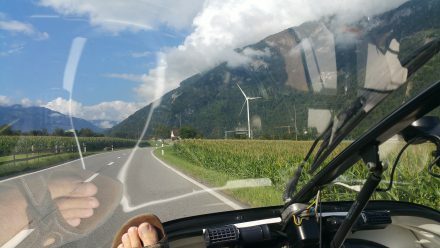 After much deliberation, by chance, I saw that last years’ one-day trip with a BMW i3 over 4 Swiss passes was exactly a 430km trip! How fun would it be to do the same trip on ONE charge! I started preparations and took a full day off for this trip. 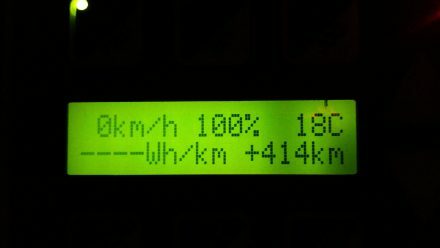 What follows below is an exercise in extreme hypermiling whilst fully utilizing my batteries’ capacity, optimizing the vehicle and my driving style. 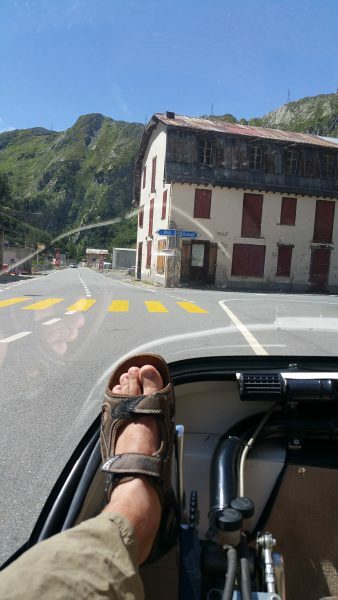 If you don’t know exactly what you are doing, please refrain from changing discharge and charge voltages on your TWIKE. You might damage your precious batteries beyond repair. My new pack consists of multiple parallel strings of 100 4.2V max charge lithium cells. My maximum charge DC-bus voltage for this max-range test is therefore 420V. Samsung’s technical spec puts the minimum cut-off voltage for this cell at 2.65V. After consulting many real-world discharge curves for this cell, anything below about 3V doesn’t promise to give you any real range anymore since the curve is in near-vertical decline and very sensitive to any kind of load. Not wanting to damage the cells during this test, I limit the TWIKE’s cut-off DC bus voltage to 300V. The evening before my test, to get as much energy into the cells as possible, I charge the cells with a very low charge rate of 0.02C. This charge should end around one hour before I set out. Other preparations consist in pumping the tyres to 7.5bar, removing all non-essential cables I usually keep in the TWIKE and disconnecting my DRL (8W*11.5h=92Wh which are potentially up to 3km range more!). That’s how fine we’re cutting things here! Although I start out with rather dense fog, I can sense that this will be a very nice day. 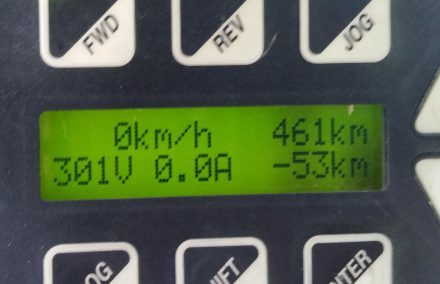 With voltages above 415V, TW560 refuses to recuperate, requiring me to change my driving style drastically since there is no efficient braking available. This is not much of a problem, given the small roads I’ve chosen to get to Zurich. Arriving in Zurich at a very respectable 36.9Wh/km, I hit heavy morning traffic. 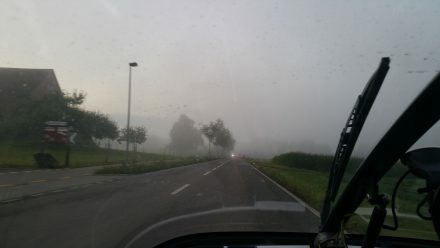 During TDAF2016, JC and I got stuck in heavy morning traffic around Zurich’s University. I wanted to avoid this and chose a different route. Better, but still a lot of stop-and-go. Leaving Zurich I was up to 40.2Wh/km. Aaaragh! 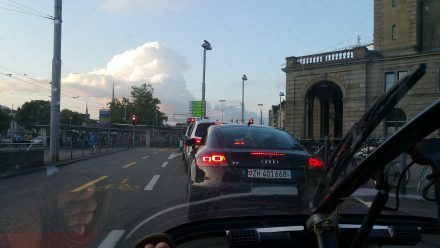 Zurich’s morning traffic – NOT good for consumption! A very long period of perfect cruise-controlled driving along lake Zurich and beyond follows. Here I am able to get consumption back down to 38.2Wh/km, even though I’m climbing continuously. 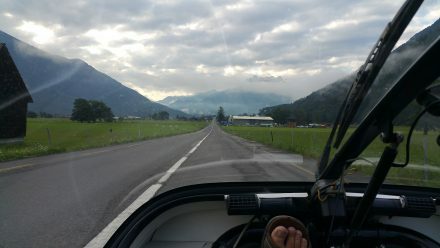 The drive along the Rhine valley is very, very long. 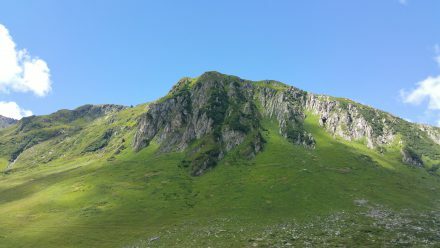 At least the clouds are being replaced with a brilliant blue sky and rising temperatures (which we hypermilers like!). 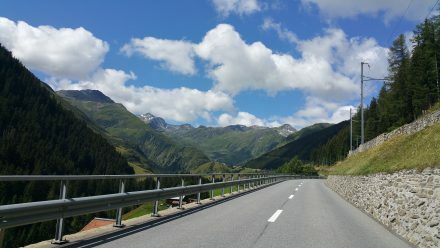 When looking at the average speeds for today, there is a peculiar 89km/h spike for about 10 minutes – this was the only part I did on a motorway, avoiding the Kerenzerberg pass and only investing about 9km at higher speeds. I’ve optimized the route to avoid crossing other streets as much as possible. However, the further up the valley we go, the fewer options I’ve got for optimization. CalandaWind, a project TW560 already visited last year. 1.8MW energy powering the city of Chur and beyond. Arriving in Chur @ 6.3kWh consumption, we’ve climbed 200m and I’m still at a very respectable 39.8Wh/km! But now, finally, we climb for real – Engage cruise-control and up we go! 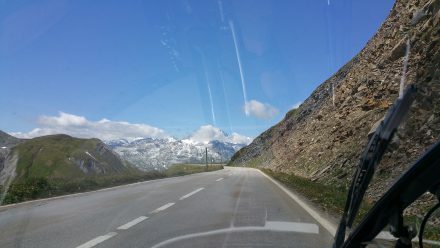 The climb is definitely slower than last time I came here in July: With Ralph’s 29E I drove from my home to a place called Flond – just above Ilanz, a little further down the valley on one charge – 100% motorway and in a hurry. This summer was very warm. Above 1900m altitude this has had a profound effect on nature – everything is extremely green. Nevertheless, the night before, cold temperatures and rain are visible now as a thin veneer of snow above 2000m. 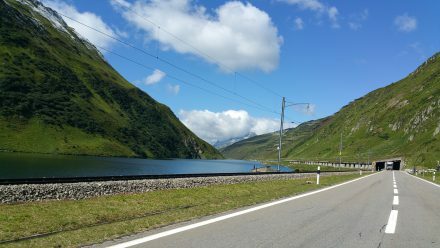 Just a quick photo and some short explanations to a Dutch couple later, I’m already on my way back down to Andermatt. 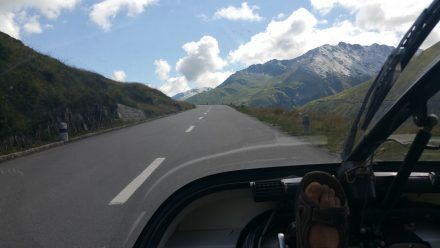 The weather is perfect and I am able to get down to Andermatt without touching the brakes once! 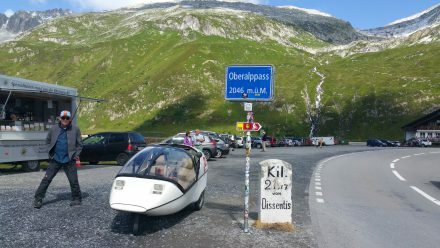 4°C – Oberalppass lake: super clear but brrrr! Whew – highest point for today! The surrounding alpine view gets better by the minute. I’m so happy to be privileged enough to live in Switzerland! If I didn’t want to go back to Zurich I could decide to visit the beautiful Valais valley (and potentially seeing my long-time reader Seb with his unwavering commitment to eating good food, drinking high quality alcohol, discussing interesting things and generally having a good time) right here – just don’t turn right towards the Grimsel here. 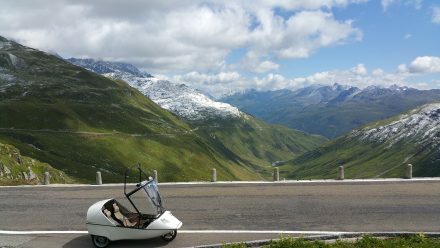 Decisions, decisions: Beautiful Valais valley or up to the Grimsel? 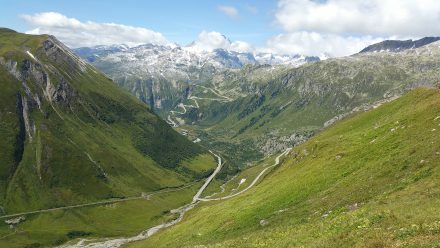 After just a few km I reach the Grimsel pass and my third pass for today. 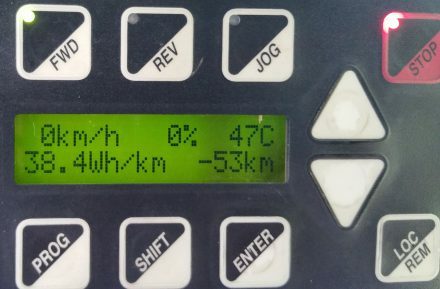 45.8Wh/km & 12.7kWh. 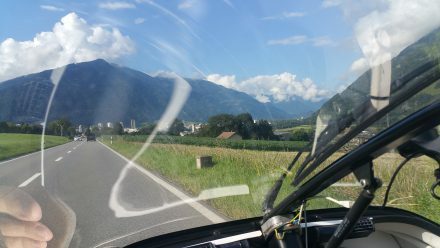 From here I get to recuperate and roll many, many km downhill until I arrive at Meiringen. 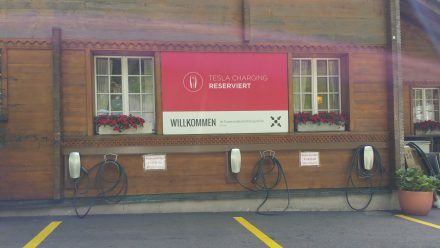 From there I climb the Brünig pass and drive past Tesla’s first destination charging facility in Switzerland (according to the information available to me). From here my route takes me via Lucerne to Cham, Zurich. By the time I arrive in Zurich, I’m at 15.5kWh with 39.4Wh/km. With roughly 2kWh still available, I decide to extend my route direction Steinmaur and the Rhine river. My pack’s voltage goes lower and lower and is evermore susceptible to big variations depending on the load requested by the drivetrain. With the last few Wh left in the battery at my arbitrary 300V cut-off, I make it home…just! I’m very, very happy with the result – see for yourself! Home to Salzburg in one charge! Home to Vienna on one recharge! 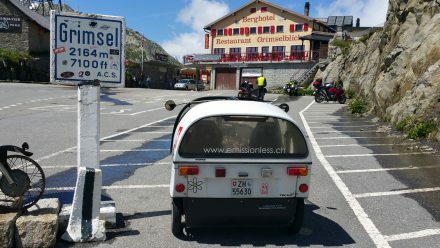 4 alpine passes and STILL only 38.4Wh/km! Extremely proud to have made it with a consumption level this low! 17.77kWh delivered. I’m impressed. Well worth the wait, well worth the investment! 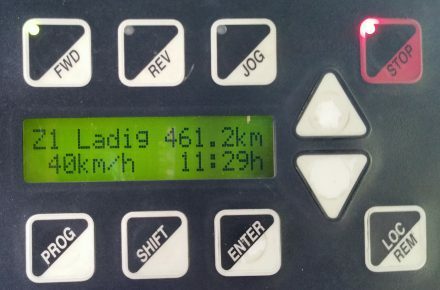 And – as usual, I still averaged a decent 40km/h. Another interesting piece of information is charge efficiency. With 17.77kWh discharged, how much energy do I have to invest in order to have this energy available in the battery? Charging Li* batteries is much, much more efficient as with my old NiCd batteries, where about 20% of all energy invested was transformed into heat. My Li* batteries have an overall (battery charge plus controller etc.) 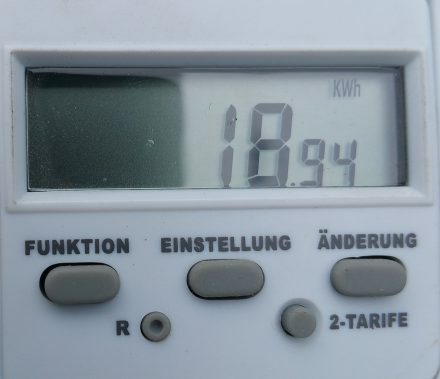 loss of 1.25kWh which is about 6.8%. 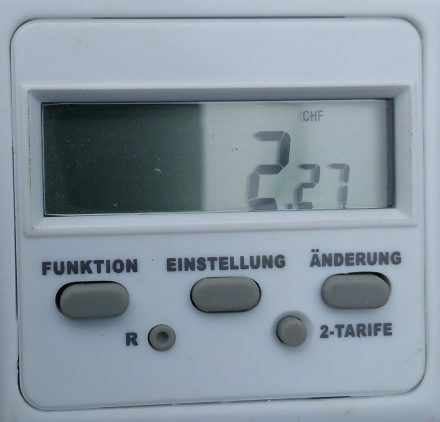 When calculated with the cost of energy with my local utility, my 461km 18.94kWh charge cost me (only) CHF 2.27. Very proud having been able to do this trip on one charge – see the elevation profile below: I went from 389m to 2436 and back with multiple smaller passes in between. And anyone interested in how i am able to keep a rather high average speed of 40km/h even with Zurich’s early morning traffic, the graph below might be of interest: My cruise controlled average speed is 48km/h and I don’t limit – where possible – any speeds above when rolling downhill. With some calculations and further assumptions, I configure the controller to show me a real-world, battery saving, hypermiling range prediction. I’ll be in touch with Dreifels with my ideas on how to realize an intuitive “daily/trip-mode” setting for our beloved Dreifels controller. Finally: My 51Ah pack has arrived!